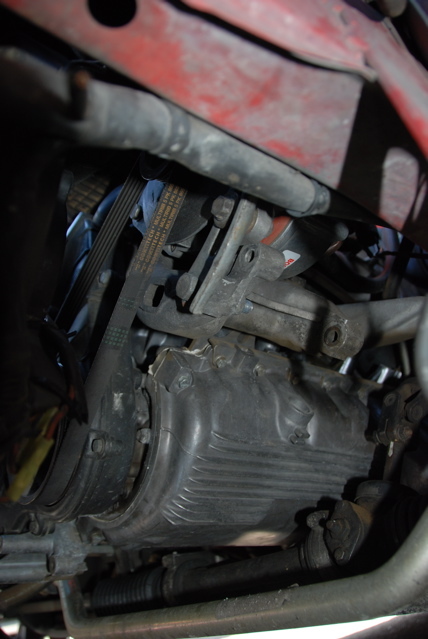 On 944's equip with factory A/C, a belt runs through the alternator and A/C compressor. It's not as simple as removing the A/C compressor and getting a shorter belt to the alternator because the belt tensioning is done at the A/C compressor pivot point. Porsche sells a A/C delete kit which relocates the alternator to where the A/C compressor was and uses the same factory hardware for tensioning the belt. This is a real nice setup and have the added benefit of bringing the weight of the alternator to a lower center of gravity. The drawback is the price, about $160 for the A/C delete kit. 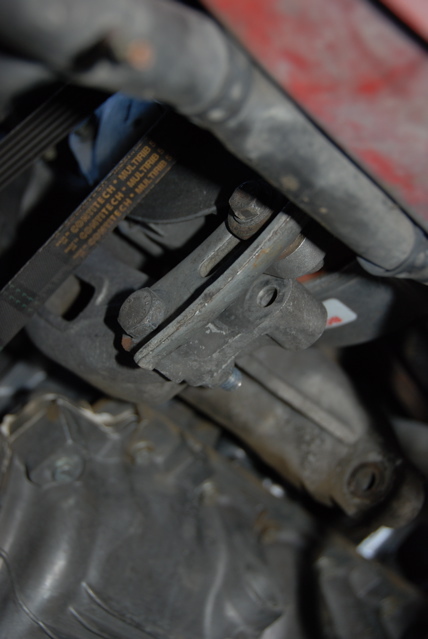 This article shows how to make a bracket to pivot the alternator for the belt tensioning, the alternator is left in place in it's original factory bracket. The tensioning bracket was made for less than $5 (five dollars). What you'll need is a alternator adjustment bracket simliar to the ones in the following picture. VW works nice. It doesn't matter which car, what we're looking for is an oblong hole to use for tensioning adjustment. We purchase these various brackets at a local pick and pull for $2-$3 each and all these will work. What you'll need besides a bracket. a 13mm head bolt with 8x1.25 threads between a 1"-1.5" long. 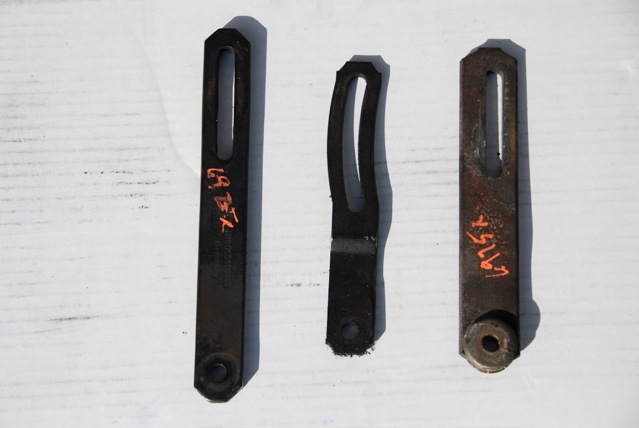 flat washers for the bolt, how many you need depends on the thickness of the bracket. a shorter belt. 6PK860 for a six rib belt, 5PK860 for a five rib. You'll need to cut these down to about a 5" overall length starting from the end with the oblong hole. 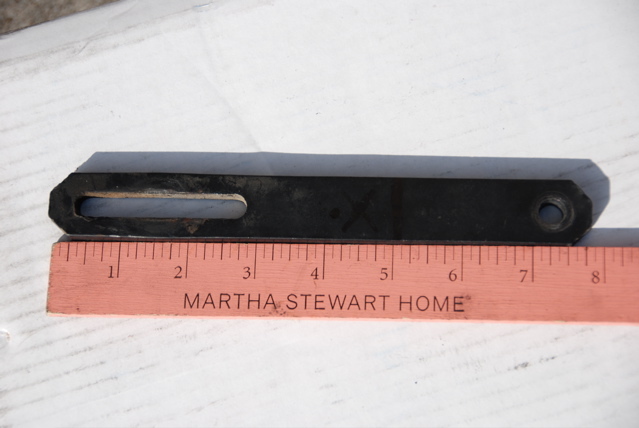 Using the Martha Stewart ruler as a guide you can cut this piece at the 5" mark and drill a 23/64" hole at approximately the 4.5" mark. The hole can be a little bigger if you don't have a 23/64" drill bit. That's all there is in making this bracket! Unscrew the top alternator bolt. Slip the alternator bolt thru the bracket's 23/64" hole and loosely tighten back to the original top hole. Unscrew the bottom alternator bolt and remove completely. Your alternator should be able to rotate with just the top bolt holding it. Rotate it up slightly to clear the bottom alternator hole. Install the 13mm head bolt thru a washer and then the oblong hole and then thru a couple of more washers and finally screwing it into the alternator hole. Adjust the belt tension by rotating the alternator up for more tension. 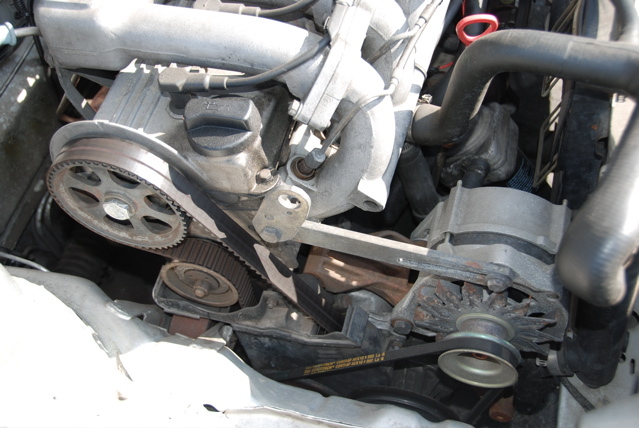 Once the belt is at the desired tension, tighten both the alternator bolt and the 13mm head bolt. 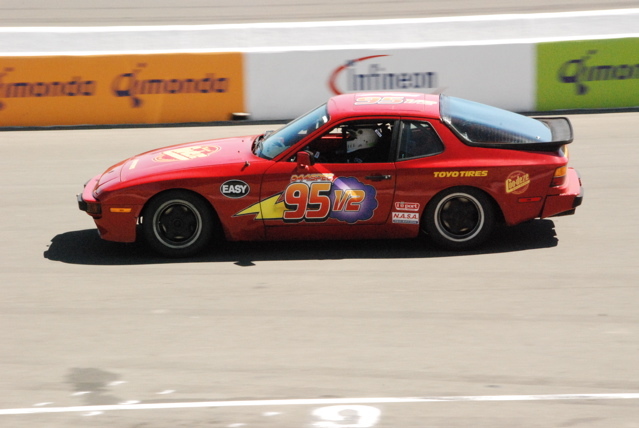 This method worked for the #95 944-Spec car for the race season and also for the 25 Hours of Thunderhill endurance race. The alternator did not come loose nor did the belt need to be retighten. Special thanks to Art at AutoPoint Motors for coming up with this idea after looking at his VW Rabbit.